I Will Win On Gin is a daughter of the 6666’s famed stallion Tanquery Gin and out of Auburn Ali, a mare with 25.5 calf roping points herself and a full Sister to Stran Smith’s mare, Hardrock Melody. 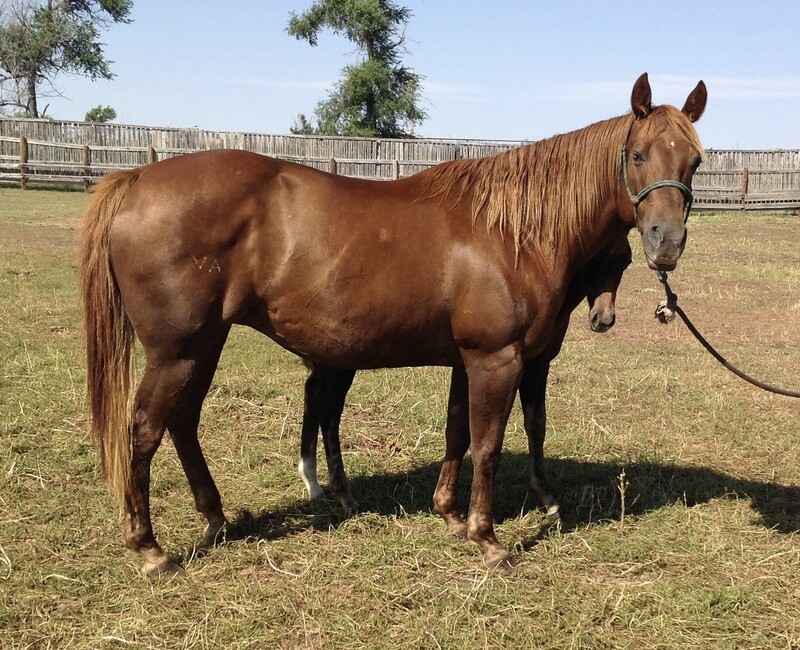 Ginny herself had 6 months training with Brent Lewis and was well on her way to being an exceptional calf roping and barrel horse when a stifle injury cut short her promising career and started her on to a new one as an outstanding broodmare. Her colts are good sized and athletic. She is bred to Zan Parr Nic for a 2018. Zan Parr Nic is a son of Reminic and Sparkles Rosezanna, a daughter of Zan Parr Bar and Diamonds Sparkle (Shining Sparks Mother) Sparkles Rosezanna earned 258.5 AQHA points in 6 events including reining, working cow horse, heading, heeling and calf roping, as well as winning the NRHA Open Futurity. Zan Parr Nic is a money/point earner in reining and working cow horse. Roping Royalty for sure. The colts out of these two mares should easily pay for them and the rest of their producing years are gravy. Finney Quarter Horses are dispersing their horses including colts, prospects, broodmares, and horses that were ridden last year but are now retired. We are only keeping the old grannies . All horses are at our place in Shawnee, Oklahoma. Pictures are of Ginny, Zan Par Nic, Suns Lola Falana, Ginny’s two colts.